While snow removal may be necessary to prevent overloading and collapse or to clear off space for construction or repairs, it also exposes workers to a number of risks. Employees might need to climb directly onto the roof and use equipment such as shovels, snow rakes, snow blowers and ladders. These operations may also be performed from the ground level using snow rakes. Aerial lifts are sometimes used to access roofs and apply de-icing materials. Snow, ice and wind can make it difficult for contractors to maintain their footing and grip while working in the winter. Are there any hazards on the roof that might become hidden by the snow and need to be marked so that workers can see them such as skylights, roof drains and vents? Based on the building’s layout, how should the snow be removed to prevent unbalanced loading? What are the maximum load limits of the roof and how do they compare with the estimated total weight of snow, snow removal equipment and workers on the roof? What type of fall protection will be used to protect staff on roofs and other elevated surfaces? What training will employees need to work safely? How will mechanized snow removal equipment be elevated to the roof? Whenever possible, use methods to clear ice and snow without workers going on the roof. Staff can climb up ladders to apply de-icing materials or use snow rakes or drag lines from the ground. Keep in mind that workers and bystanders standing below could become trapped under snow falling from roofs and suffocate. Mark a safe work zone in the area where snow will be removed and keep people back 10 feet from the point where snow is expected to be blown or fall. Ensure workers are wearing eye and head protection, especially when removing ice. When using snow rakes, have staff remove small amounts of snow at a time. If it is necessary for workers to access the roof for snow removal, evaluate the loads exerted on the roof - total weight of snow, workers and equipment used - compared to the load limit. Snow load is the weight of the snow as generally reported in pounds per square foot. The weight of the snow will vary depending on its water content. 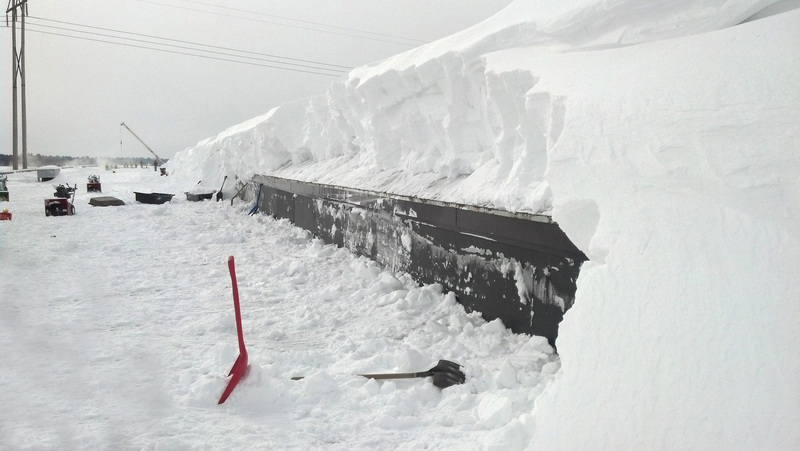 Snow load on the ground can provide a rough indication of roof snow load, but roof snow loads also depend upon factors such as melting and re-freezing of snow and ice, drifting, roof slope, type of roof and design features.